It's the end of March. Every year at this time I look around, do a quick inventory, check myself in the mirror, and celebrate that, yes, I am still alive. The month didn't kill me. This year I had resolved at the start of the month that I would not let it get to me. And then a different firecracker went off in my face for the next 31 days. But that's over now. Here we are -- as this fiendish month draws its final breaths -- still going. I recognize that fact each year by acquiring a few celebratory cards. Just a few, because who has time to scope out a palette of cards in March? The cards arrived the other day and you'll see them in several different posts, but right now I want to show the ones that most make me smile. Because March is dying, dammit, and I'm ready to smile. 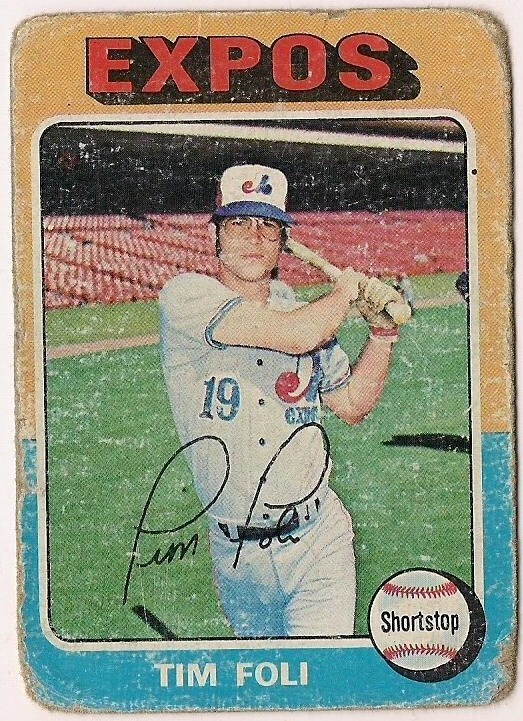 I decided to make an effort in my quest to complete the 2001 Upper Deck Decade '70s set. 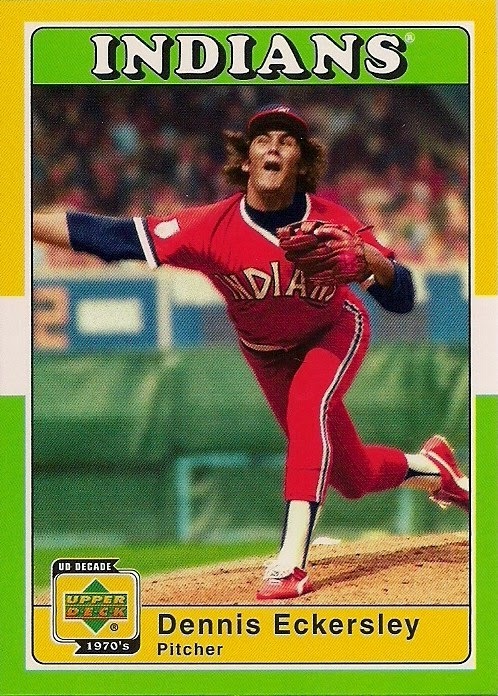 But except for the above absolutely amazing Dennis Eckersley card, I didn't end up picking up any base set needs. 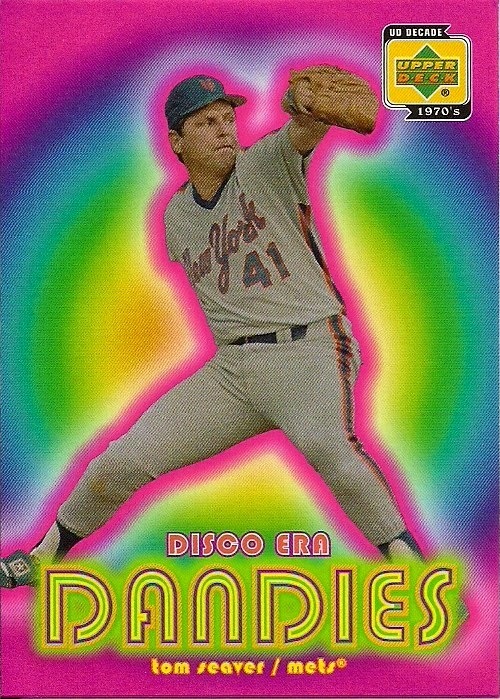 No, instead I went for the brightest and loudest cards -- and headed straight to the inserts. 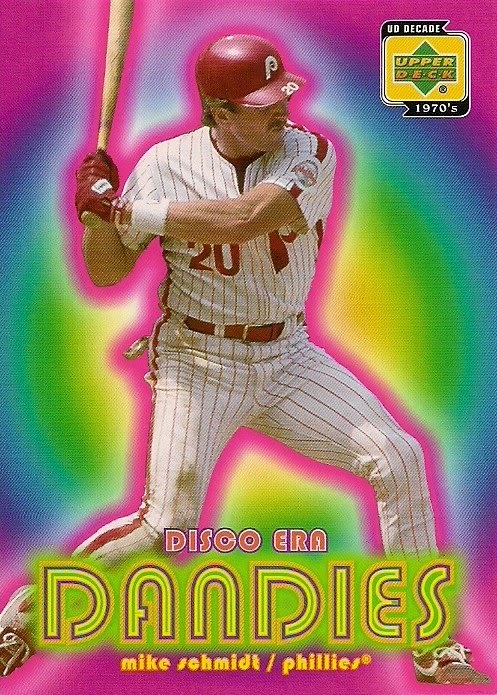 There are several different insert sets in UD Decade '70s, because of course this isn't really the '70s, it's the 21st century and, oh, yes, THERE WILL BE INSERTS. This is from the insert "Arms Race". I grabbed just one card from that set, only because I wanted the J.R. Richard card. These don't scan that well, because the background is shiny -- another clue that this set has just as much to do with 2001 as the '70s. 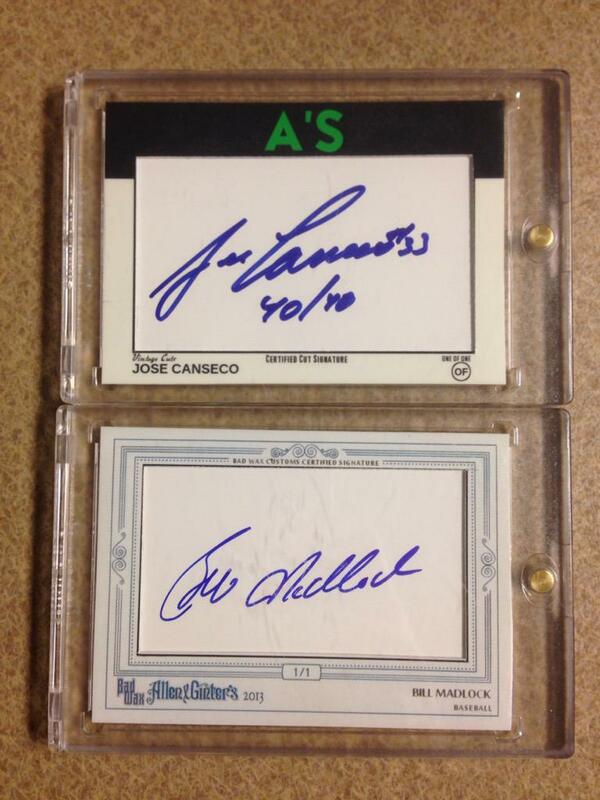 The two inserts sets that I like the best are the two most colorful. And I decided to complete each of them. 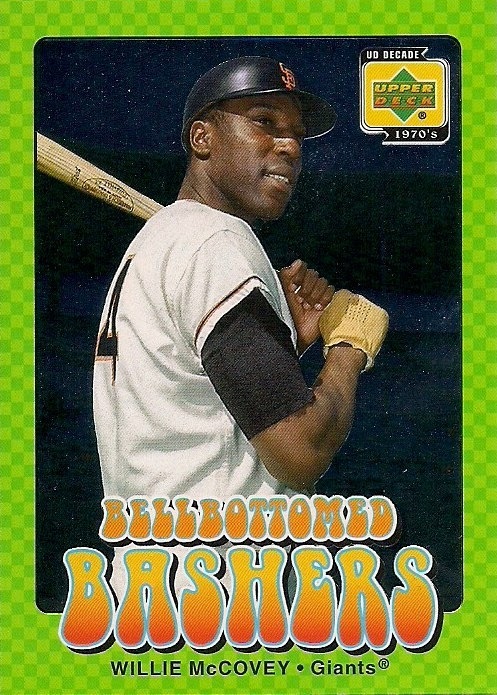 That covers the entire slugging spectrum of the '70s, from the early years (McCovey and a very young Jackson) to the end of the decade (Thomas and Foster). That makes me all giddy. I thought it'd be forever before I finished that. 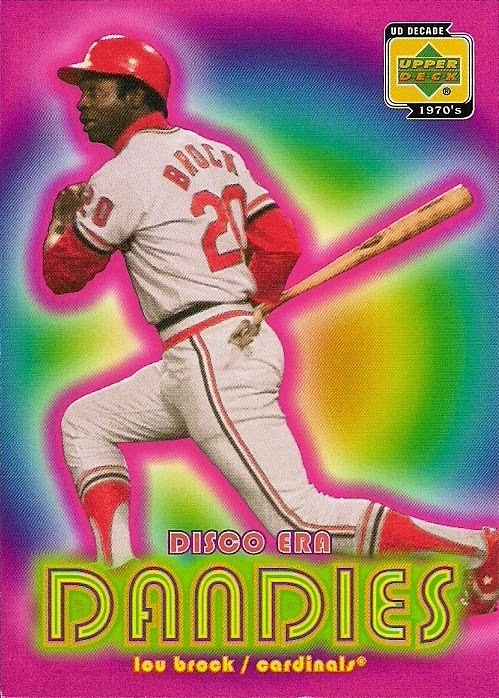 Truthfully, I don't know if all of these players are right for a set titled "Disco Era Dandies". 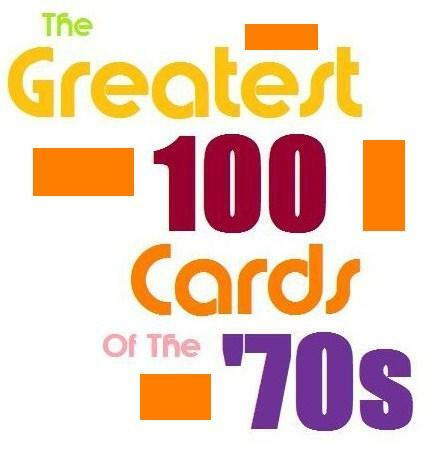 If I was doing this set, I would have filled it with 1979 Pirates, with one extra card of Sister Sledge. Then there's the fact that Jackson's photo is definitely not from the '70s (nor Schmidt's). And just to get even pickier, the names for these sets are painful. Nobody played with Bell Bottomed uniforms in the '70s, and "dandies" is some term from the 1940s. But forget all that because LOOK AT ALL THE COLORS!!!! And two insert sets are complete! And it's the end of March! And baseball is five days away! 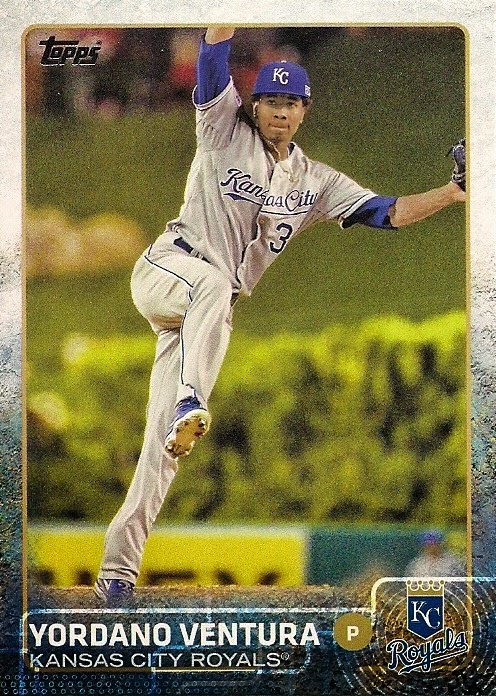 It's incredibly easy to find night cards in current sets, and there's no better example than the most current of flagship offerings 2015 Topps. To underline just how available night cards are, terrific-sender-of-packages Dave shipped me a bunch of 2015 Topps night scenes amid the great selection of other cards he sent (I'm getting to those, I promise). I immediately went about determining whether they qualified for my night card binder, and I was pleasantly surprised to see how many made it. 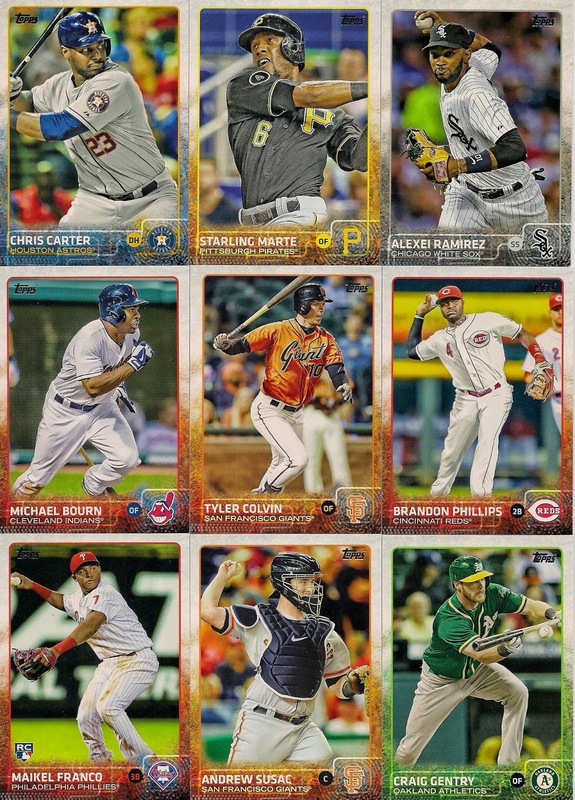 It's the fickle nature of the Night Card Binder that allows Marlon Byrd, Andrew Susac and Maikel Franco into the binder, but not George Springer's excellent card. 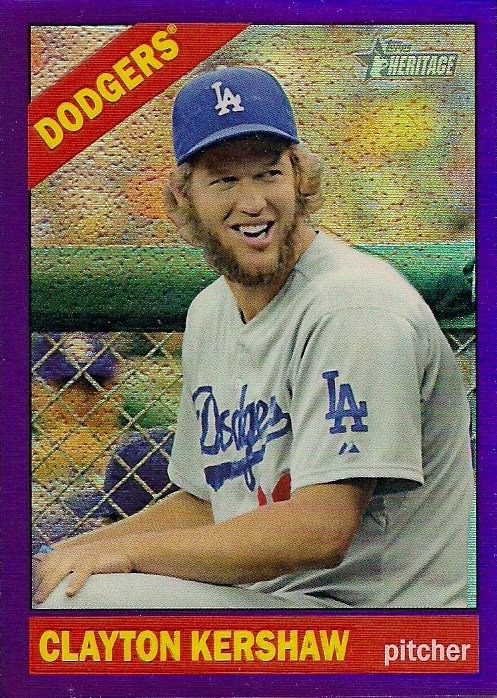 As you well know, this is #1 in the Topps set. I have a card in the #1 spot in my Night Card Binder already. Ah, it's like those Red Sox-Yankees battles from 10 years back! Manny Being Manny against The Captain. Somebody alert ESPN. Both of these cards have historical context, which is always a plus. The Jeter card recognizes the end of a memorable career, while the Ramirez card recognizes the start of a memorable career. The Upper Deck Fun Pack Manny is just too fun. You may remember there was some stupid hub-bub over Jeter being named card #1 for the set, and some asked why he didn't receive card #2, the uniform number he wore for all those years. So did Topps miss a chance to get this Jeter in my Night Card Binder by not making it #2 in the set? Nope. Jeter wouldn't have even come close to booting this card. (P.S. : Don't fret, Derek fans. I think there's a Jeter card somewhere else in the binder). I still get emails from people periodically asking me for advice on how to run a blog. No, not Hope Solo, although she could learn a thing or two from me, but from regular card-collecting people. Some want to know how to get started, or how to get trades going, or how to get some interaction. My advice is simple and nothing no one else hasn't said already: you just have to be yourself, write about what you like, and maybe most of all: get out there. How does one "get out there"? Well, like I said, you have to be yourself and write what you like. Don't write things on your blog that you don't believe or don't interest you. There is a temptation to do that if all you're looking for are readers or comments. But it won't end well. Write often. Yes, that takes time and none of us have time. But like anything in life, you get what you put in. Writing often not only attracts readers and keeps you in their very active and busy lives, but it makes you a better writer. That is basic advice for any writer -- whether they're publishing novels or hunting down stories for a daily paper -- write, write, write. It will make you better. As far as getting cards and trading? My advice is: don't make this the sole objective. I've seen some blogs that existed only so the writer could obtain cards. The only time they commented was when someone ran a contest, the only time they posted was when loot was gained or could be gained. A lot of those blogs have short lifespans or operate on life support. A blog needs more than "transactions"; it needs you. It needs an invested you. But if you want cards and can keep a blog going that at least entertains a handful of people, then you're going to get cards. It also helps to read other blogs because every once in awhile someone is offering cards you might like, and since you're "out there," you'll land some of those cards once in awhile. This card is from Cardboard Collections. 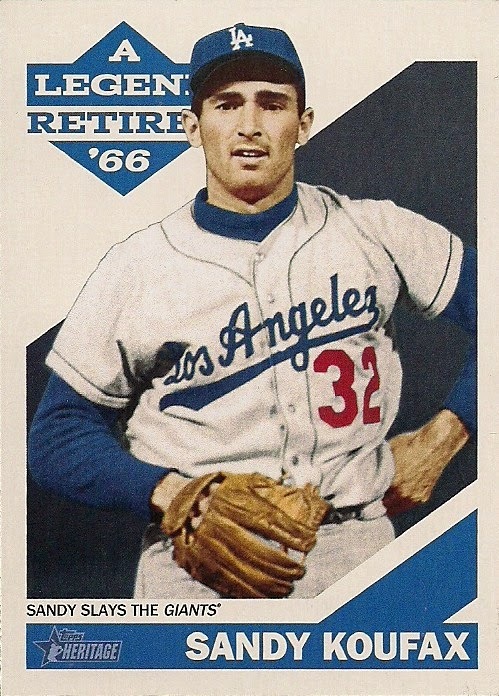 Colbey opened a little bit of Heritage, showed this snazzy Walmart exclusive Koufax Series card, proclaimed that the set wasn't for him, and I pounced. Because I try to keep up with what people are posting -- even during this very busy month -- I was ready. See, it's not just about people interacting with you, it's about you interacting with others. Once you've posted enough and drawn some followers, people will start inquiring about trading. When I first began a blog, I had no real thoughts about acquiring new cards through the blog. 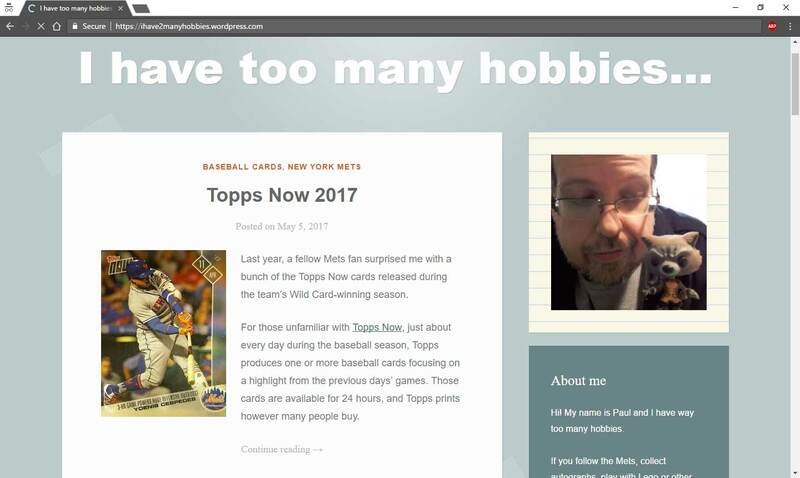 I just wanted to write about my love for baseball picture cards. But the funny thing about putting yourself out there is that the more you say you like cards, the more relationships you form and the more cards -- that you want -- will come your way. After doing this for more than six years, I've developed relationships with collectors of just about every team (although some relationships -- like the Rays and Marlins -- are dormant). They know me and I know them. 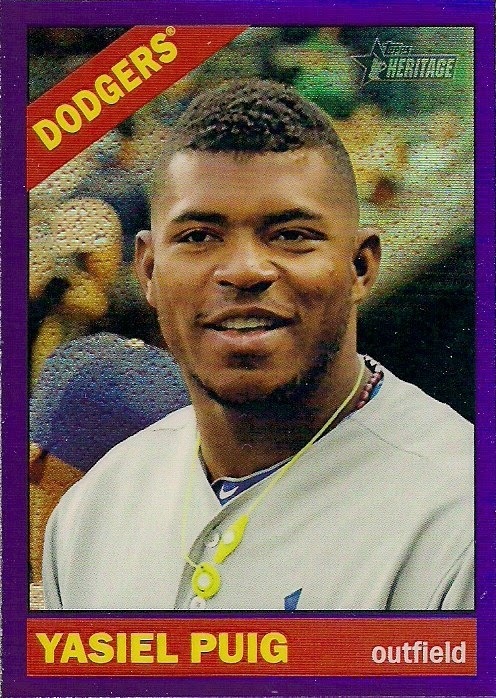 Recently, Brewers fan Tony L. of Off-Hiatus Baseball Cards sent me some cards out-of-the-blue-like because that's what happens when you've put yourself out there. He helped me get closer to finishing my Dodgers 2014 Allen & Ginter team set since I did such a miserable job on 2014 sets myself. 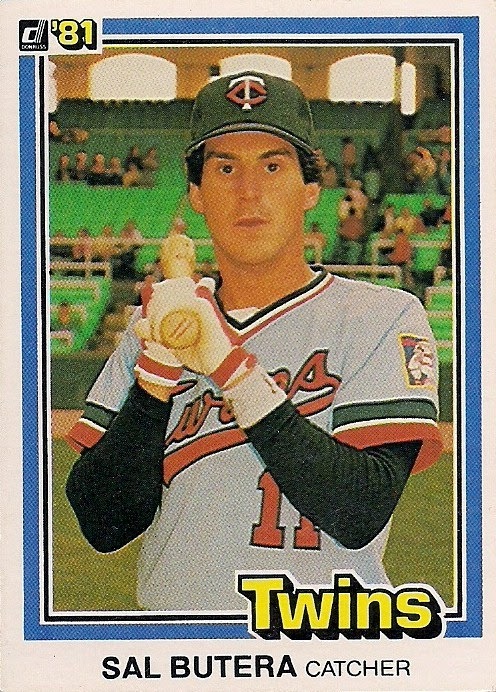 And he filled in a spot in the 1981 Donruss set quest. 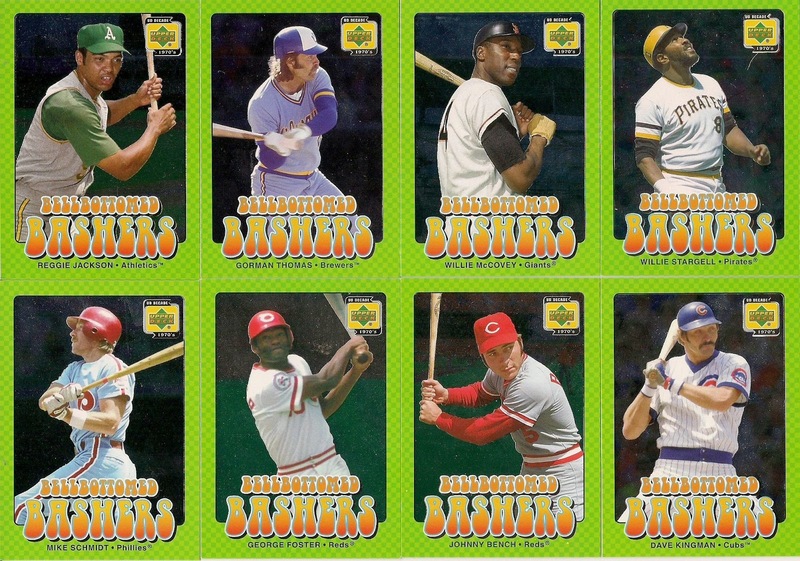 Just eight cards left to complete the set (you'll see a bunch of '81 Donruss in the near future). 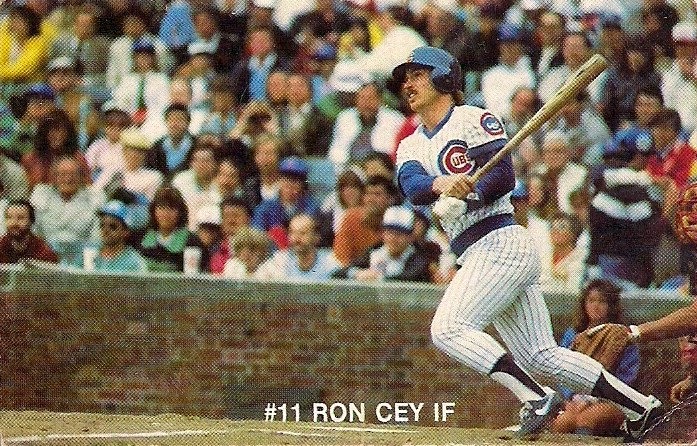 And here's a weird little 1984 7-Up Cubs Ron Cey card that I just discovered a week or so ago. When you've put yourself out there, stuff like that happens quite a bit. You see a card and sometimes it magically appears in your mailbox. (I believe that's the famed Marla Collins in the background). 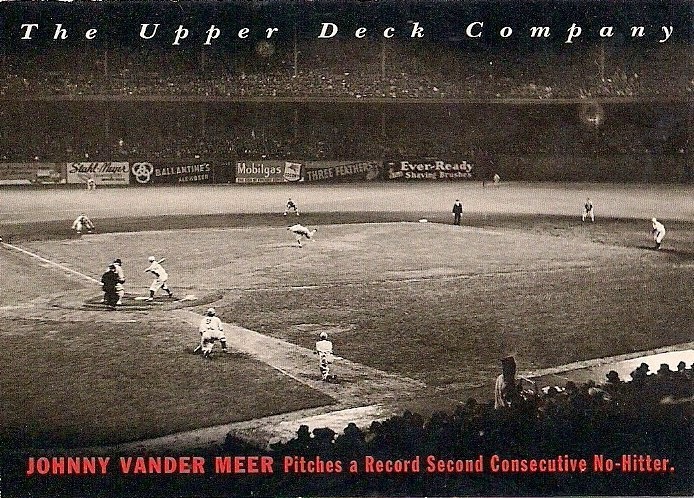 The Cey card is about one-third smaller than your standard card, which seems about right for a Cey-as-a-Cub card. So these are the kinds of cards you get when you broadcast your interests over your blog. You'll notice that these cards are very specific: team-oriented, set-oriented, player-oriented. But you've got to get out there and let people know what you like. Write it on your blog. Be your own advertiser. But don't make it read like an advertisement. If you're lucky and get enough of a following, people will automatically think of you or your blog when they pull certain cards. I consider that an honor. 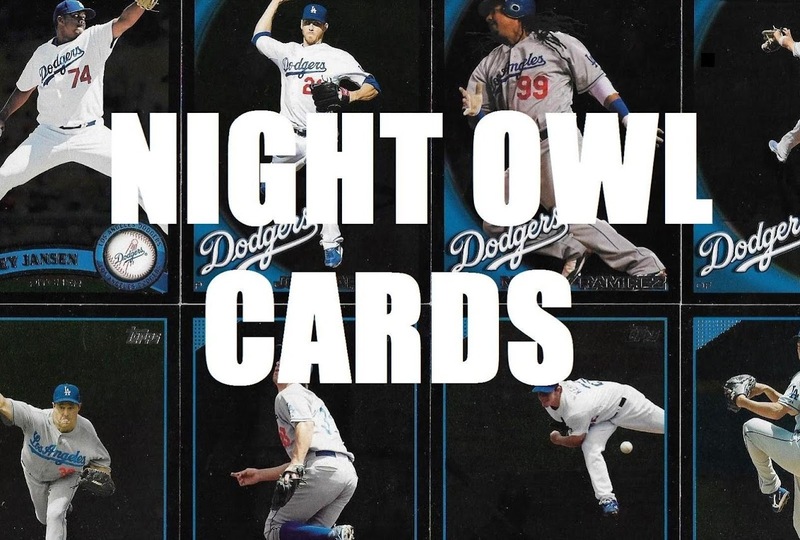 One person on Twitter who also has a blog once said that when he thinks of the Dodgers, he thinks of Jackie Robinson and Night Owl. You can't have a better blog impact than that. So, this is what happened a week or two ago, when Zach of Autographed Cards pulled a couple of Dodgers. He thought of me because I've been yammering about my appreciation for Dodgers cards for, oh, 5 or 6 times a week for the last six-plus years. 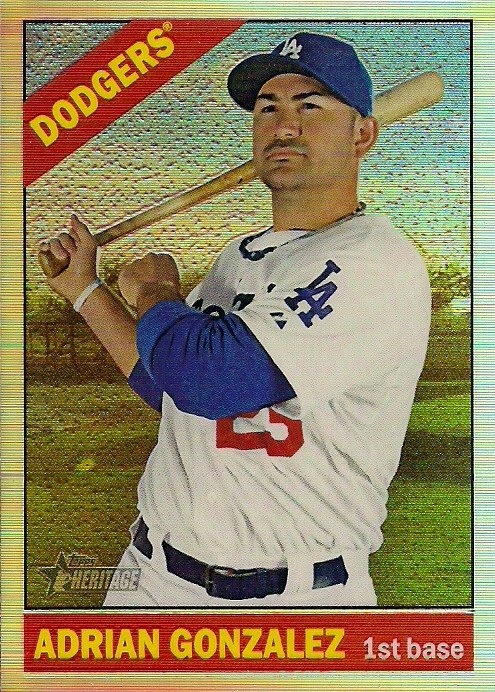 A Heritage Chrome refractor of the Dodgers' hit machine. And purple refractors of the last two Topps flagship wrapper cover boys. I daresay Zach hit the Dodger motherlode. 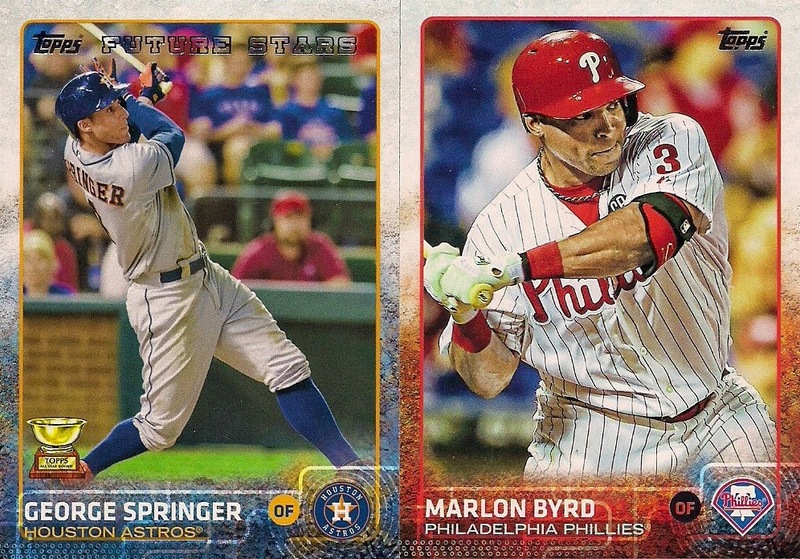 These three cards I believe exceed the total number of base Dodger Heritage cards I have for the 2015 set. That's the kind of craziness that can happen when you're writing a blog almost every day and at least a few people are reading it. You got to get out there. Sometimes it's easy to do, but other times it isn't. It's almost like building a relationship with someone you like. If you want it to grow and see interest from that other person and get something out of it, you gotta do. You've got to put yourself out there. Hopefully -- and there are no guarantees -- you will have success. And, if not, well, at least you won't be buried in cardboard. There are benefits to that, too. "Can't you say something NICE?" Yes, I can say something "nice". I do it all the time. Even right here on this blog. I think what clouds the issue for some people is that I'm not afraid to point out something wrong -- in life or on the blog. I refuse to be sugar and sunshine all the time. I'm actually a very happy person who likes to laugh, enjoys people of all kinds and has a wide variety of tastes and interests. But I won't run a blog where it's "golly gee" every moment and every comment is "Nice Cards!" Yes, sometimes the cards are very nice. Other times, they're crap. I'm not too shy to point to a pile of stink and say "THERE'S CRAP THERE! HEY, EVERYBODY, DON'T STEP IN THE CRAP!" I don't look at that as being negative. I'm trying to be helpful. 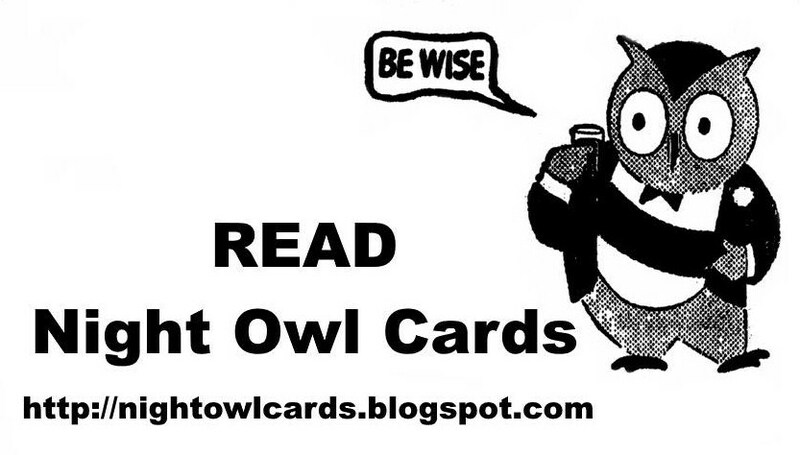 Strong opinions is how readers came to Night Owl Cards ... well, that and some bitchin' cards. 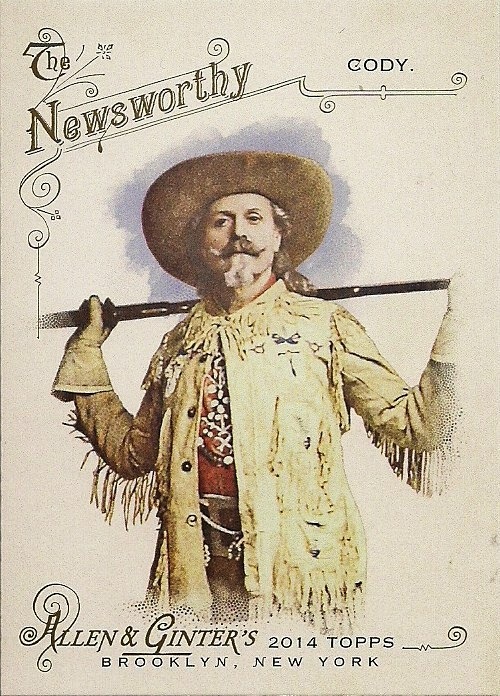 And I promise I won't ever pull punches when writing about trading cards. I calls them as I sees them. I tell it like it is. I say a cliche is a cliche, and I've just written two of them. 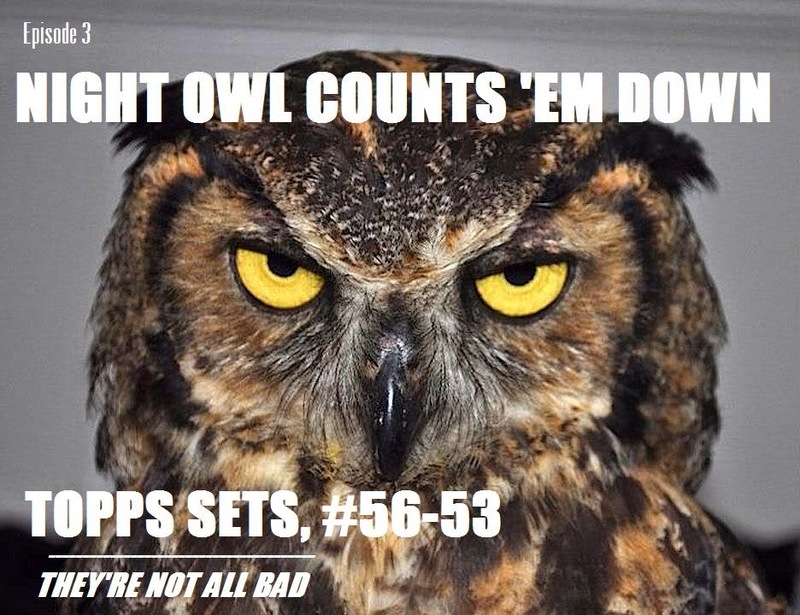 And that leads into episode 3 of Night Owl's All-Time Topps Set Countdown. These are sets ranked No. 56 through No. 53. They are sets that I don't really like, but can probably find something NICE to say about them. 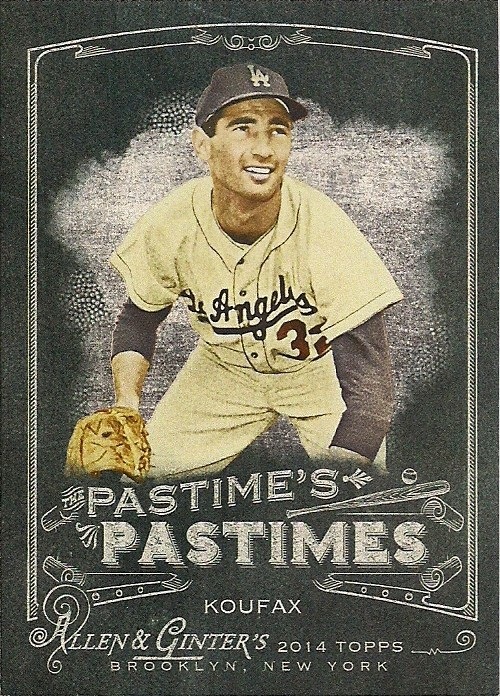 Truthfully, I can find something nice to say about all of Topps' sets. But that isn't the objective here. 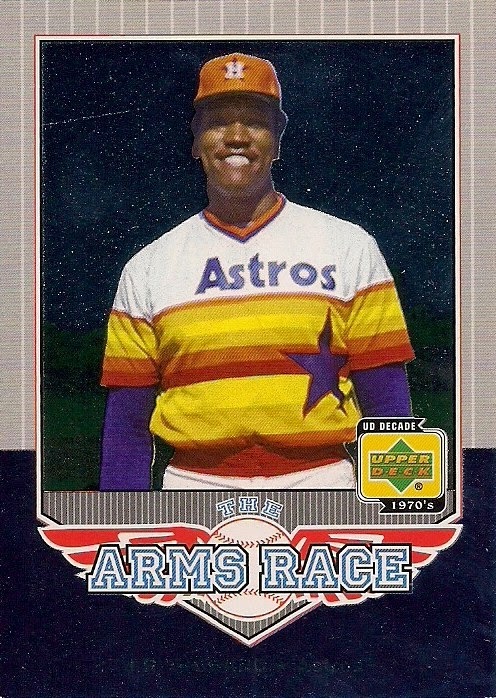 Every Topps set isn't going home with a ribbon and a popsicle. 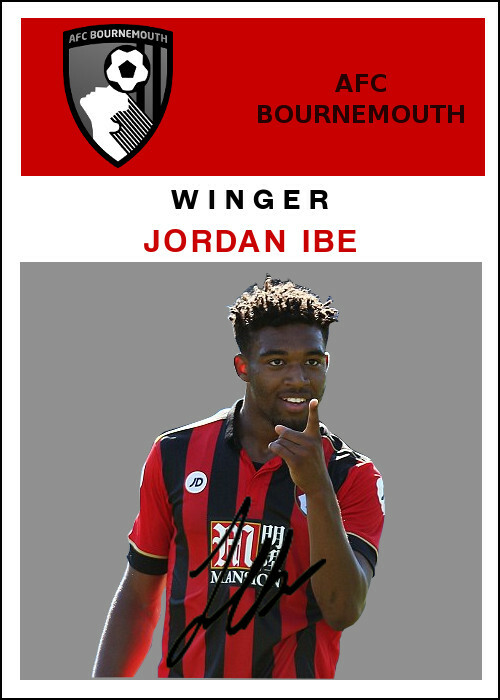 I'm not taking all the Topps sets out for Capri-Suns after this countdown. I'm ranking sets from worst to best. So, let's look at a few sets where I've actually got something nice to say -- that is after I tell you not to step into that crap set. This might be the first set where a significant number of collectors ranked it even lower. I've heard a lot of remarks about the color of this set. The most-often used noun/verb in these remarks is "vomit." Yes, the color of the border is bizarre and could be nauseating. 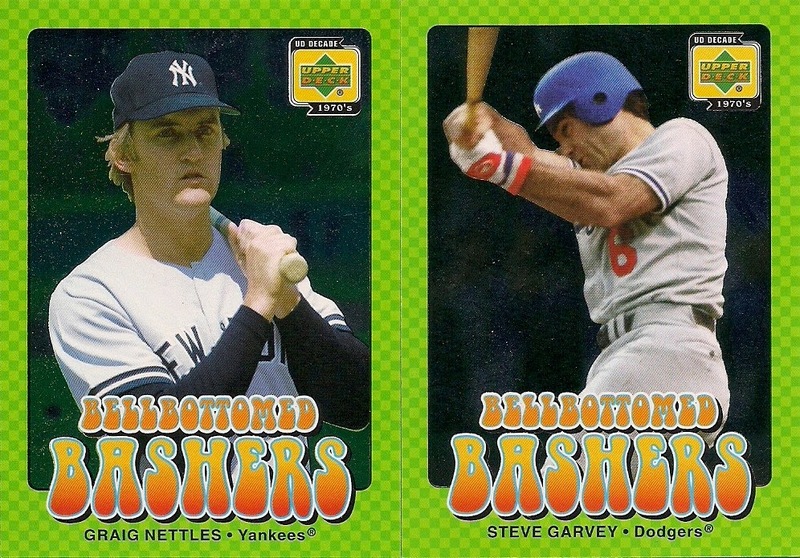 It was an era of strange borders for Topps. I'm not a fan, but I do like it better than the more traditional gold sets from 1998 and 1999. I like brighter colors, whether it reminds collectors of vomit or not. The design features two positives. First, the set mentions what it is: "2002 Topps". It's featured on every player's card. That is appreciated, especially during a time when copyright dates grew smaller and smaller. There are precious few Topps flagship sets that mention the set year on the front. This is one of them. 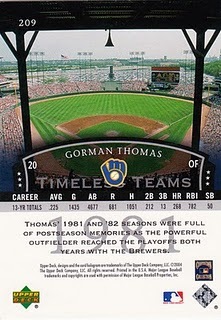 Second, 2002 Topps displays a tried-and-true design technique: ribbons. 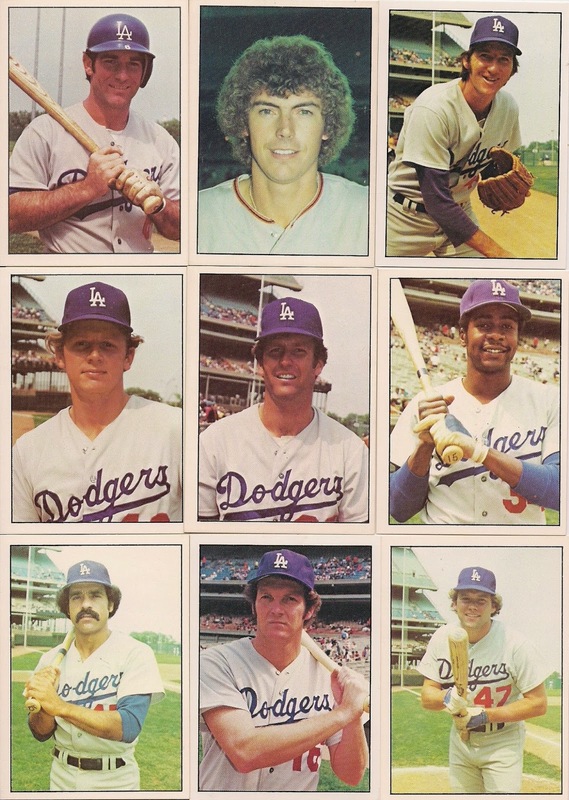 Topps has used ribbons or pennants or flags, as design elements for several sets -- 1965, 1974, 1979 -- and it almost always works. Present the ribbons in a couple of different colors, and I'm not going to get mad. 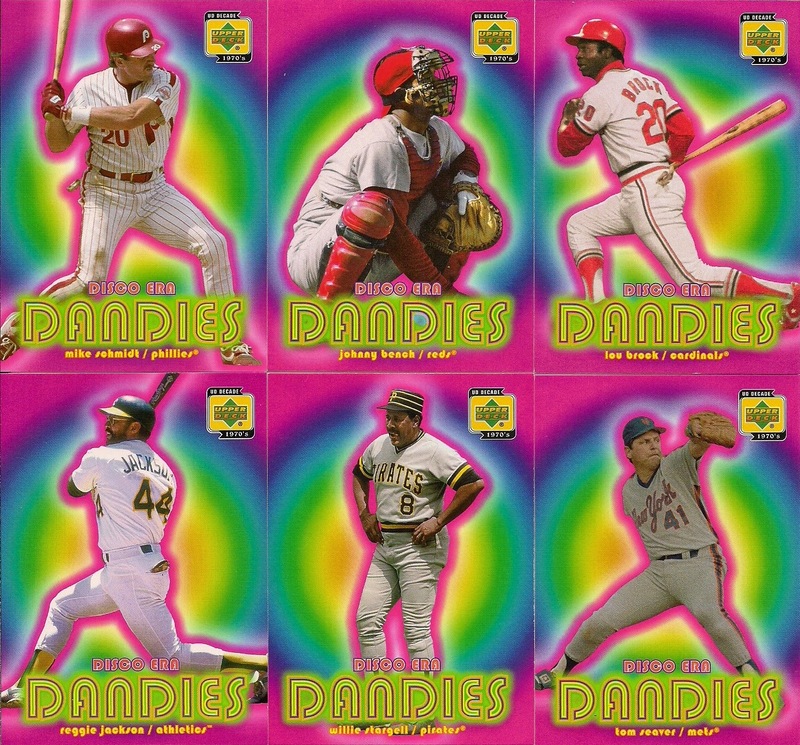 2002 Topps is a colorful set, I'll give it that. The back blares that same off-puke color. 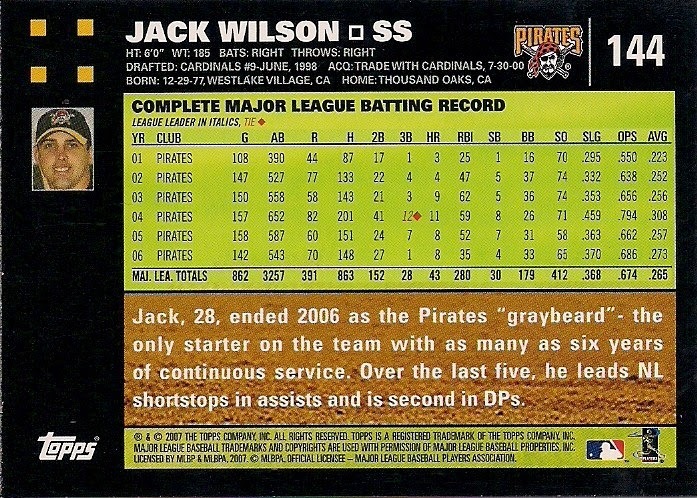 At least the card number is nice-and-large, even if the stats aren't. 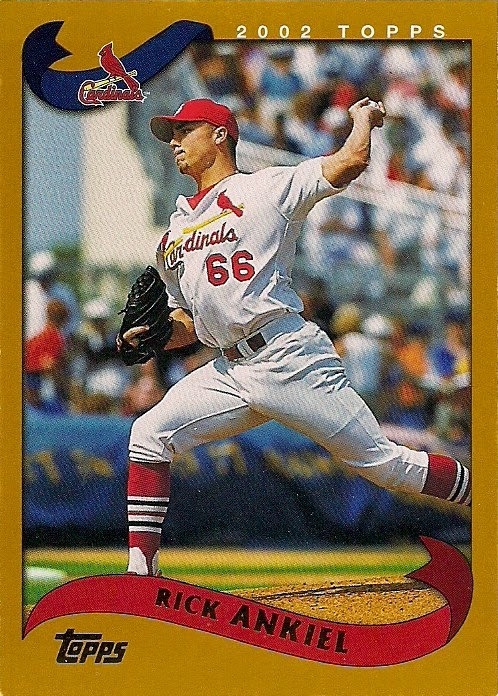 In the end, large set or not, colorful set or not, the border color choice solidified 2002 Topps' ranking near the bottom. It was just too strange of a decision for me to take it seriously, especially during a time when I wasn't collecting. Maybe if I accumulated several hundred of the cards, I would have a more favorable impression. Then again, maybe I would have had to run screaming to the toilet and you never would have seen me again. If you've been paying fairly close to attention to this countdown -- and really why would you want to do that? -- you'll notice that this is yet another set from the late '90s/early '00s that has settled near the bottom. There is now not a single Topps set between 1996-2002 that has made the top 54 Topps sets of all-time. I am officially prepared to say that this is the darkest period for Topps flagship. This is the era of bad feeling. 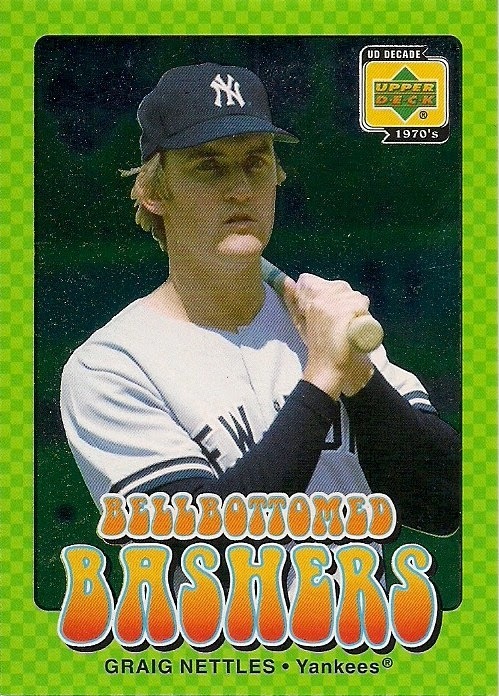 Topps at its worst. I can blame some of this on the fact that I didn't collect cards during this time, but I'm trying to look at these sets fairly objectively and none of them cut it. 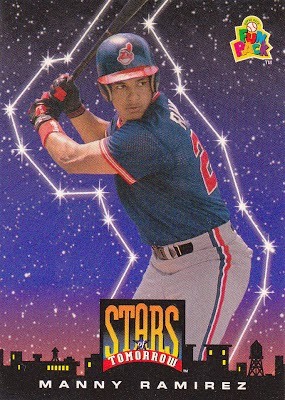 In fact, the only reason that 1997 Topps is rated this high is because the set accommodated my synesthesia. As I've mentioned many times, I am one of those people who attaches a color to each word or letter. It's something I was born with, some weird set-up in my brain. Ever since childhood I've categorized words and ideas by color and that goes for sports, too. As a kid, and into adult life, the American League and the National League have always been associated with a color. The American League always -- always, always, always -- has been red. 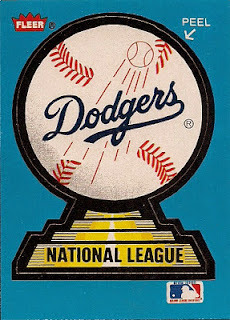 The National League always has been blue. This has been a truth in my world since the mid-1970s, since I was sucking on Space Food Sticks. It made every American League player's card red. 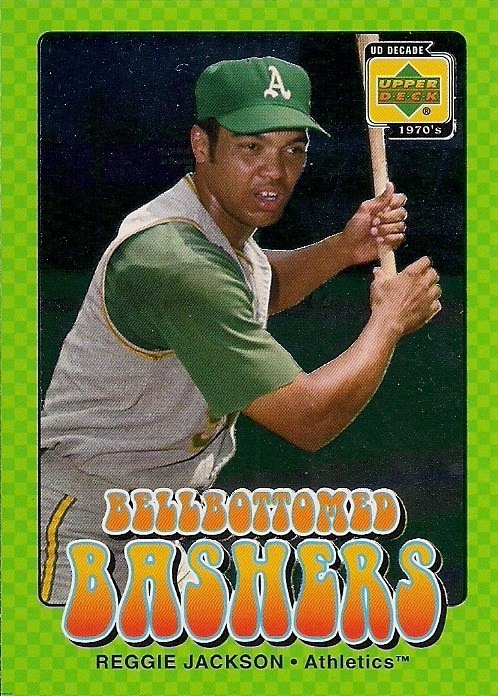 And it made every National League player's card green. OK, green isn't blue. But close enough. My brain adjusts and green is on the blue/purple side of the rainbow, so yes, this makes sense to my brain. If the red cards were orange or yellow I'd think the same thing. 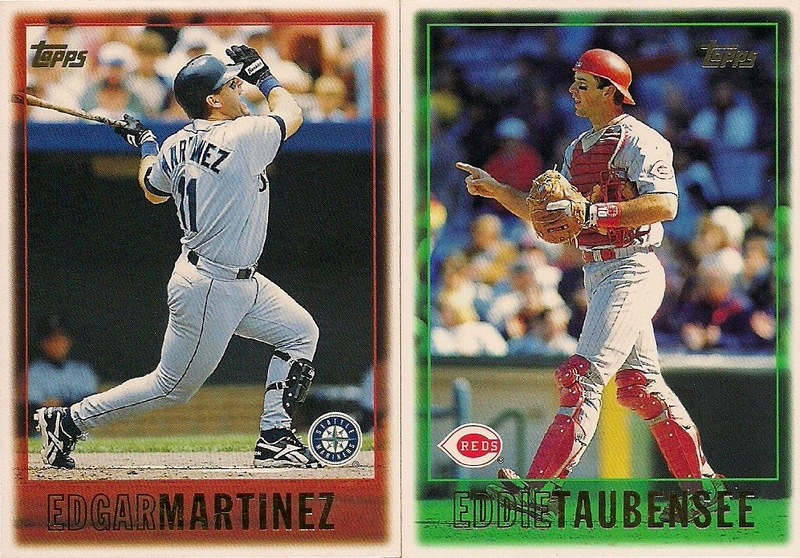 So, looking at 1997 Topps, I can't help but think how sensible this set is. All the American League teams and players are the same color and all the National League teams and players are the same color! Yes! It all makes sense! All right, maybe it isn't the thing to do the year after interleague play began and Major League Baseball started blending the American and National Leagues together, but that just means there was a subversive in the Topps office, right? Someone said "screw that interleague garbage, all the American League teams are going to be RED." That's probably not what happened, but it does make me like the set a little more. Why, once, I was going to attempt to collect this set. But then I realized it wasn't even 500 cards and probably filled with Yankees and Braves players I didn't like and I scrapped that. The backs are as garish as any non-70s set could be. They're not easy on the eyes and definitely not easy to read. 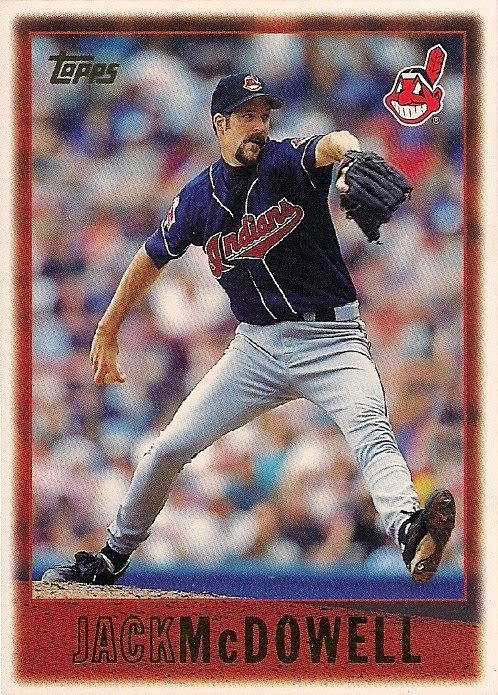 Still, I have a soft spot for 1997 Topps. For a late 1990's set, it's as good as it gets. In another time, in another era, in another period with less addiction to foil, this set would be rated much higher and possibly be considered a classic, or at least a cult favorite. 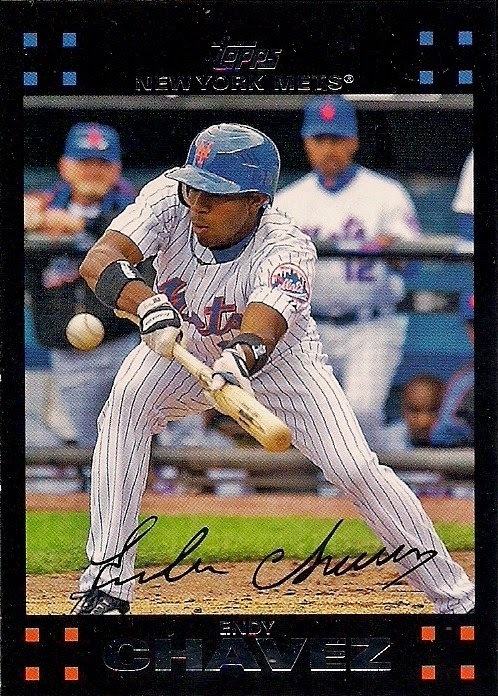 But, unfortunately for a set as sleek as 2007 Topps, it arrived during a time of cynicism and excess. 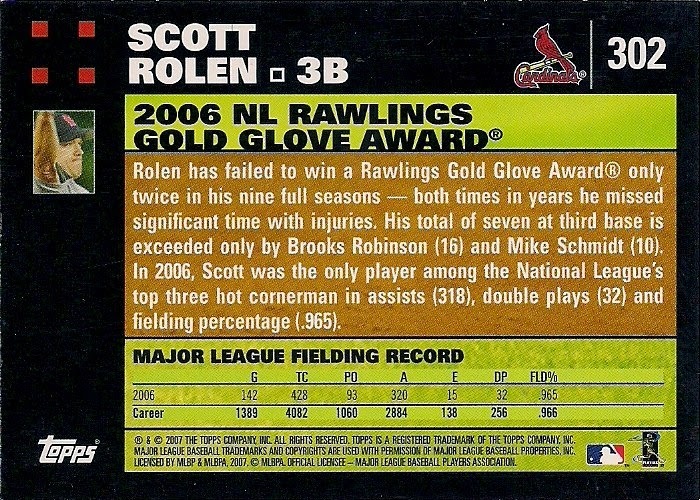 I would not be surprised if 2007 Topps is the most plentiful set created since the junk wax era ended. How can a set be special when you can find it growing out of the cracks in the pavement? 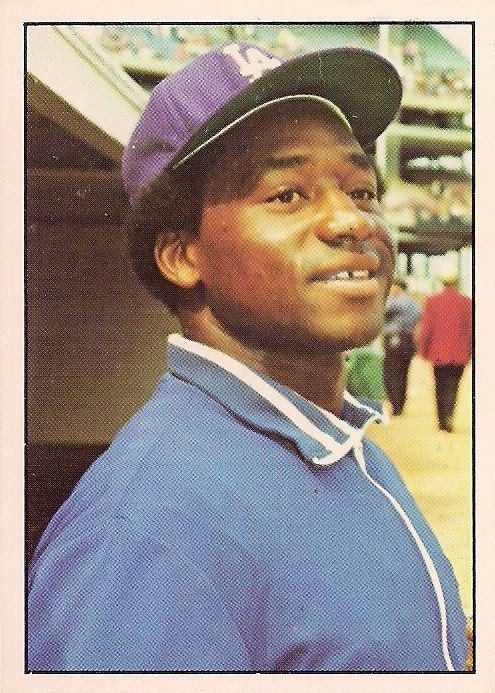 Topps also didn't do the set any favors by drenching it in gimmicks. 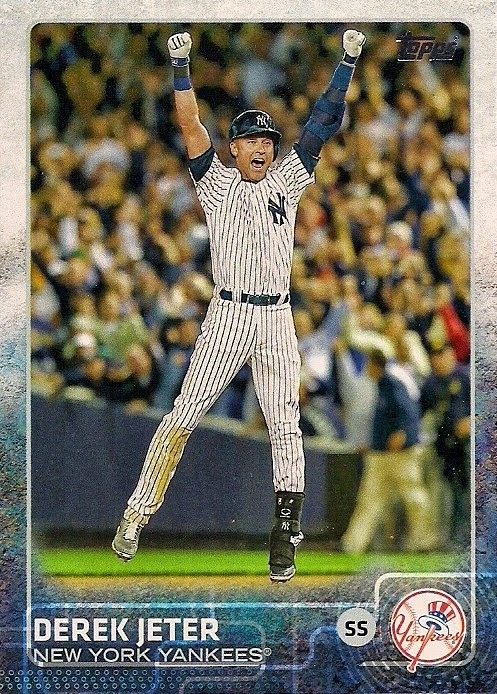 The famed Mantle-Bush Derek Jeter card will be the lasting image of 2007 Topps. There were variations that few collectors knew about. There were stupid red-letter backs and cards with no facsimile signatures. The inserts offered with this set are some of the worst ever. By the time 2007 was half over, collectors couldn't wait to be done with set, myself included. 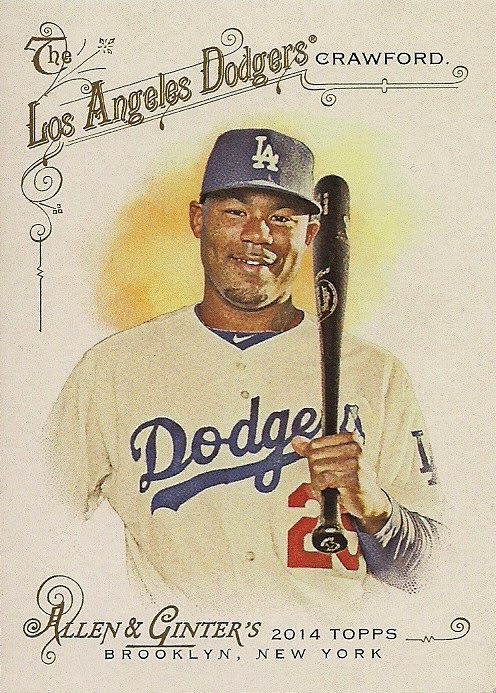 Sleekness aside -- this set looks great in a stack -- there are confusing aspects to 2007 Topps. For example, the four sets of four tiny squares are quirky enough and happily color-coded to go with each team's colors, but why are they there? I like to think it was to convey the idea that each card is film negative and together they form a film strip. But I don't think that was the plan. 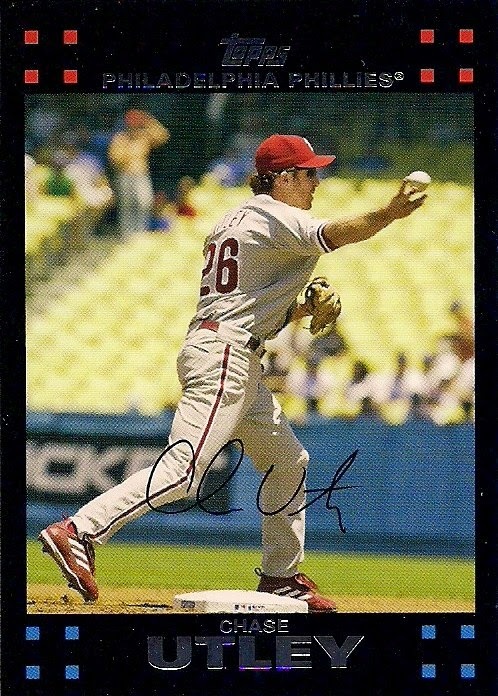 The grass-and-dirt backgrounds are interesting and fun and did catch me off guard the first time I turned over a 2007 Topps card. But it's all offset by the strange floating head shot at the left. Why is it so small? Why is there so much extra space just floating in ... um ... space? And why is the image duplicated from the front? Except in some cases when it's not duplicated from the front? Why? 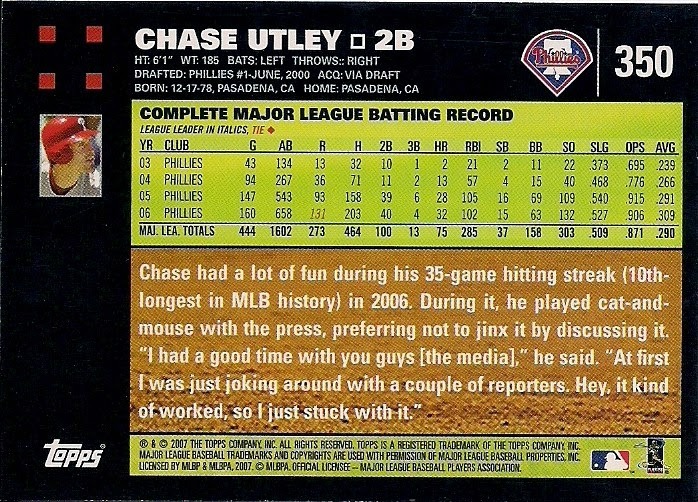 And that's how it is with 2007 Topps. 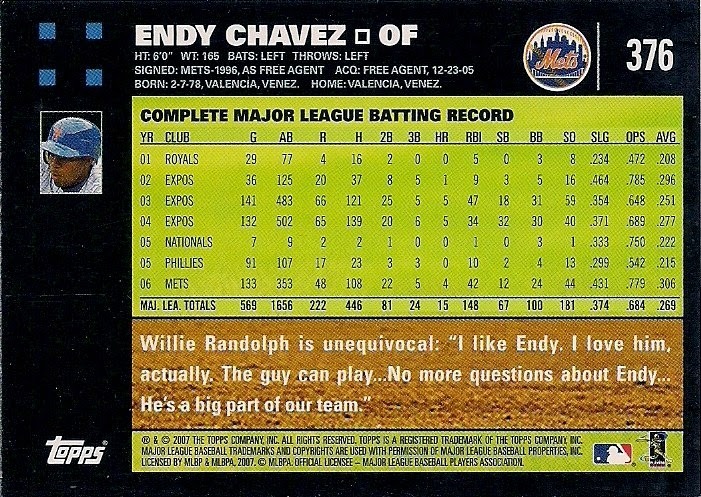 There are so many head-scratching elements, from the design to the decisions made in the set (two Elizardo Ramirez cards? Why? ), to an obvious corporate decision to start gimmicking-up flagship. 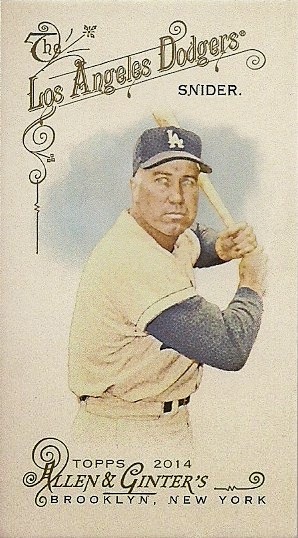 The 2007 set was Topps' first full black-border set since the 1971 set. 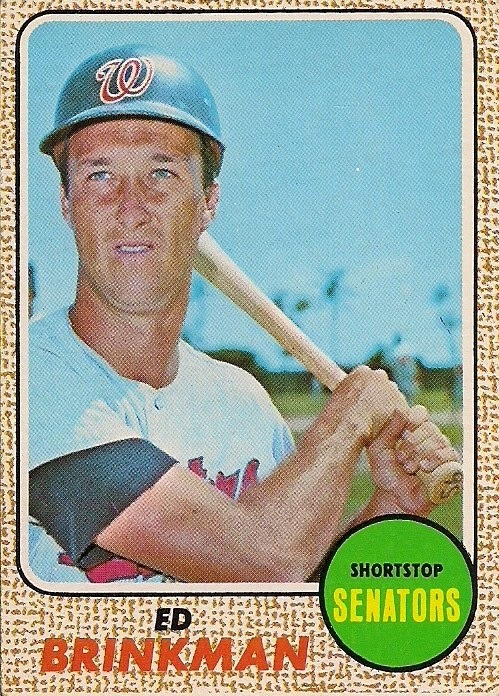 The '71 set is universally revered among card collectors, and truthfully, 2007 Topps in a lot of ways isn't that far from the 1971 Topps set. 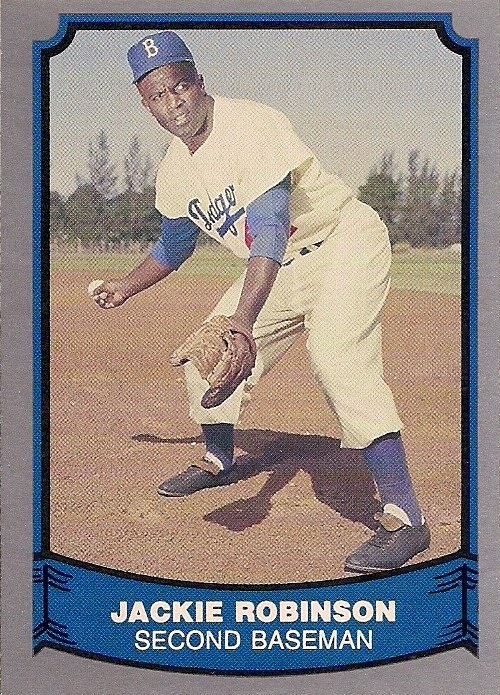 But it doesn't come even close to matching the respect that 1971 Topps has. That's a lot of people's fault. Including collectors. 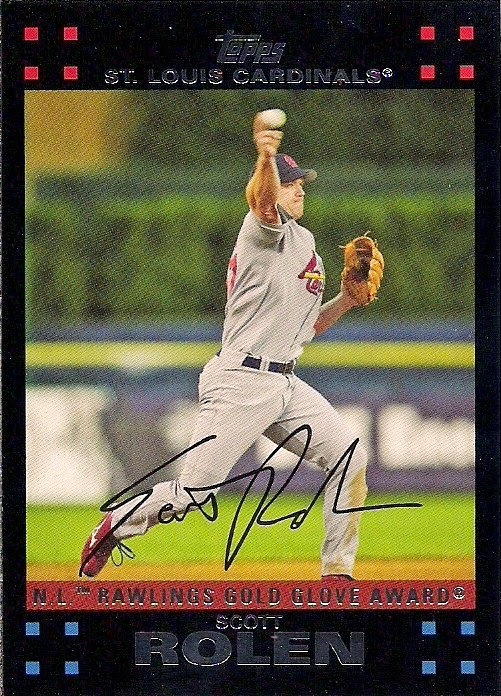 And why 2007 Topps is set No. 54. I'm trying to envision a kid in 1968 -- a kid who had collected cards for maybe the previous four or five years -- coming home from the store after buying his first cards of the year. He tears open the wax wrapper and comes face-to-face with the design for the year. And it looks like burlap. Suddenly, I imagine, collecting didn't seem as fun anymore. This is another one of those wild design decisions where I wonder how it got out the door. Maybe there was just one guy making designs in the 1960s and that same guy is the one who OK'd them. That's the only way this one makes sense. We're talking about a collecting world that was 100 percent kids at the time. What kid could appreciate a card that looked like that? It looks like something I'd be forced to make with yarn in art class. 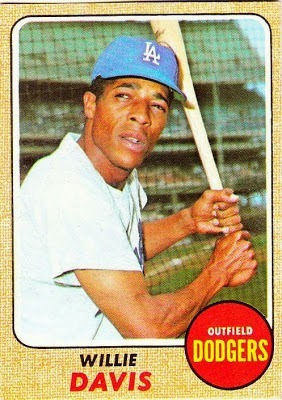 I also saw 1968 Topps for the first time when I was a kid. It was when my friend inherited a bunch of cards from his older brother. I wrinkled my nose at the '68s. What was up with those? These aren't fun. I think I hear my mom calling me to do chores. Another aspect that bothered me is the design doesn't even look the same through the entire set. 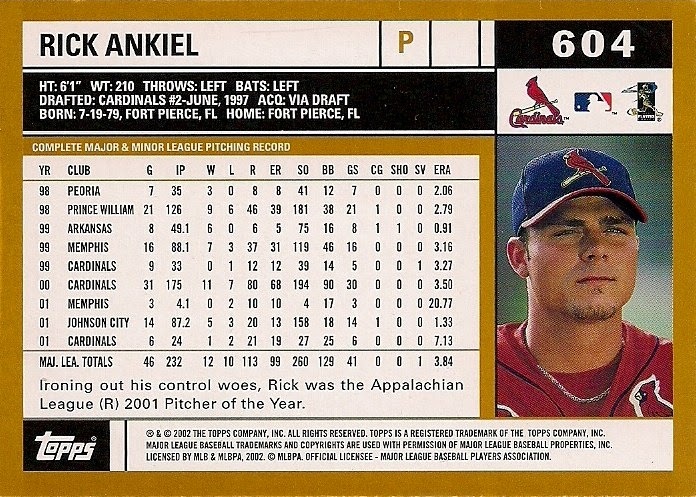 The lower-numbered cards feature wider-spaced "burlap" like the yellow-lettered Ed Brinkman card here. It almost looks like a leopard print. 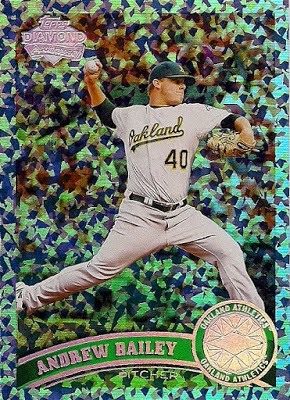 But most of the cards in the set display finer dots, making the border look more yellow and giving it that burlap look. These cards look worn and dated, even more so than other vintage cards. I've often compared the look to the wallpaper in my grandmother's kitchen, which was also worn and dated. The cards look yellowed right out of the wrappers and that's not something you want with new cards. The photos in this set are nothing special, which is par for the course in the '60s. But late '60s sets also suffer because of some photos that are a couple of years old. 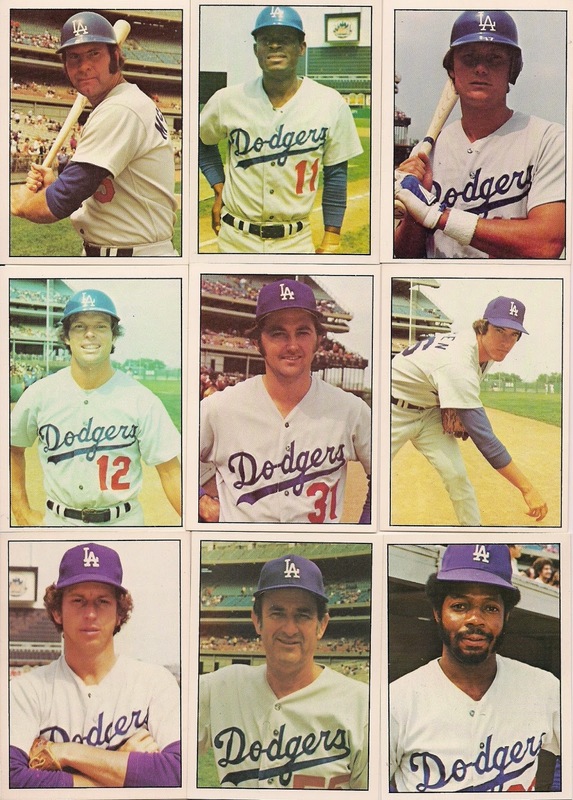 I believe (unless I'm missing some from '67), the blacked-out cap trend began in 1968, which is never a good thing. More yellow on the back. The second straight year of vertical backs had to have collectors thinking this was the wave of the future (but it was back to horizontals in 1969). 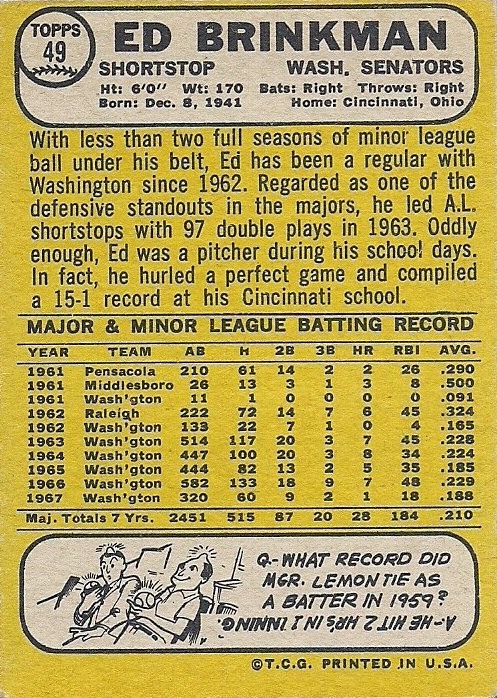 There is a cartoon on the back, which is always worth a few extra ranking points, but I never liked placing the cartoon on the bottom of the card (bad news for 1981 Topps). I give vintage sets more credit than current sets so it pains me a little to rank this set the lowest of any vintage set. There are some who look at this set nostalgically, comparing it to the TV sets of that time period. And the last couple of years I've grown to respect '68 Topps just a little more. But that doesn't mean there aren't so many other better vintage sets available. Up next: Sets #52-49. There are brighter days ahead. And that's not just a load of crap. A couple of years ago, I joined a card draft at Scott Crawford on Cards! I enjoyed it quite a bit and also snagged some random cards that were interesting but I don't really collect. One of them was this 2011 Topps Andrew Bailey hope diamond parallel. I grabbed it because I wanted a hope diamond parallel in the collection. That's the only reason. Well, since then, I've acquired a couple more hope parallels, of the more appropriate Dodger variety. And, more to the point, Scott sent a collector my way who apparently is trying to complete the entire set -- base and update -- of hope diamond cards. He needed the Andrew Bailey card as one of three cards left to completing the whole thing, and he said he'd pay me $25. I got the cash, and I happily sent the card off, and I hope he finds that Alex Avila and Frank Robinson to finish the full set. And that's enough about current cards. Time to see what I got for my $25. I went the oddball route in an effort to stretch my money as much as possible. 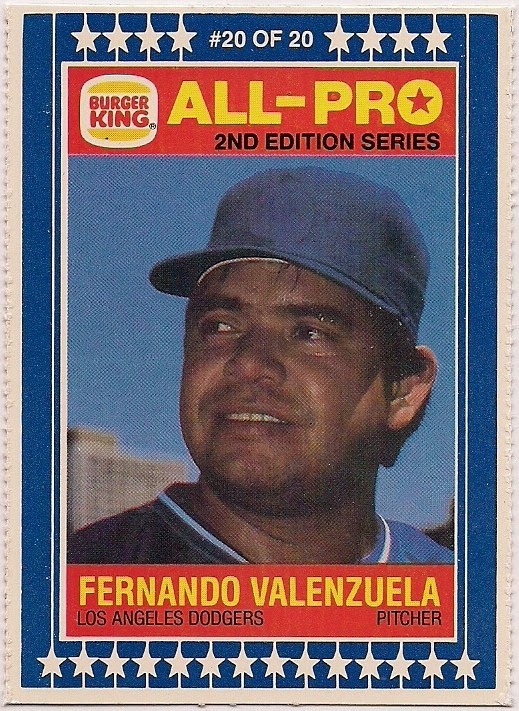 The most recent card was this 1987 Burger King Fernando Valenzuela, last card of the 20-card set. If you look closely, you can see the ghost of an L.A. logo on the cap. That, no doubt, would get Burger King sued in 2015. These two cards are from the 1976 SSPC set. 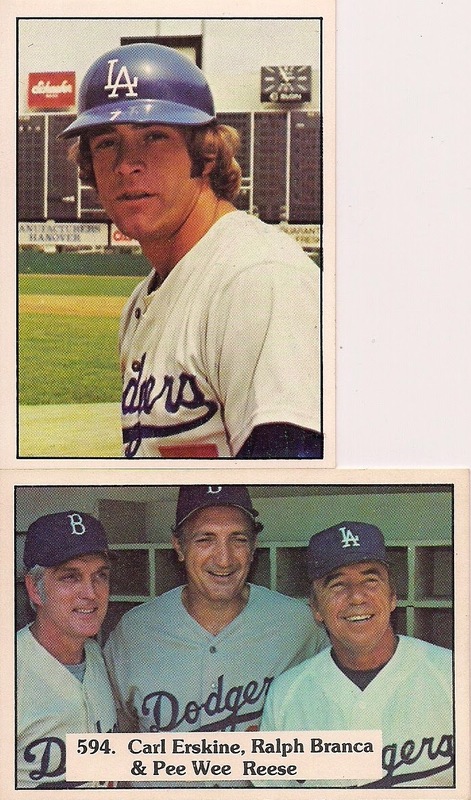 It turns out I had the Burt Hooton card already, but it doesn't matter because my Dodgers '76 SSPC set is now complete! 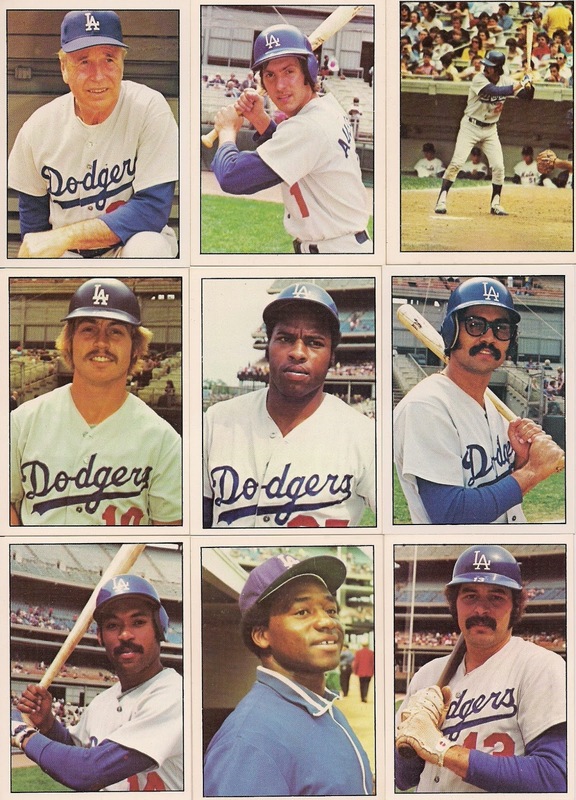 That is a collection of the Dodgers from when I first realized there were Dodgers and baseball. Special, special people in that set, plus a few that I had no knowledge of, like Paul Powell and Charlie Manuel and coach Mickey Vernon. This set is cherished not only because of what I just mentioned and the fact that it's a terrific-looking throwback to the '70s, but because it is the very first set that I ever saw that was Unobtainable. The first time I saw an SSPC set was not in a store -- you couldn't find it in a store -- it was in either a Baseball Digest or Sporting News. It was the first cards that I couldn't get by asking my mom or dad to drive to the store. If I wanted them, I had to order them through the mail. What devilry was this???? And now I have the Dodgers. On to the rest of the set. It's time to get cracking on the Hostess Dodgers. It's shocking how many I still need. 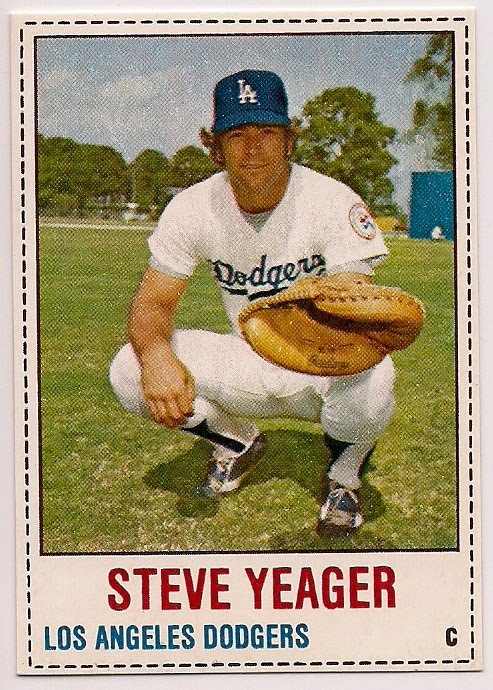 This here is light-hitting Steve from the 1978 Hostess set. 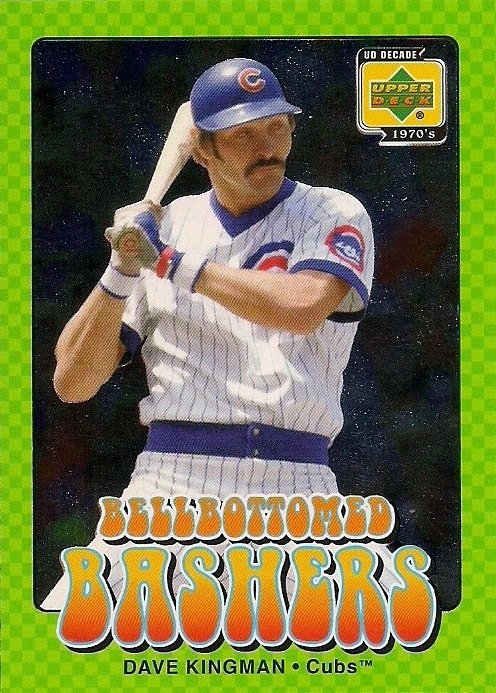 He batted all the way up to .256 in 1977. He's very proud. 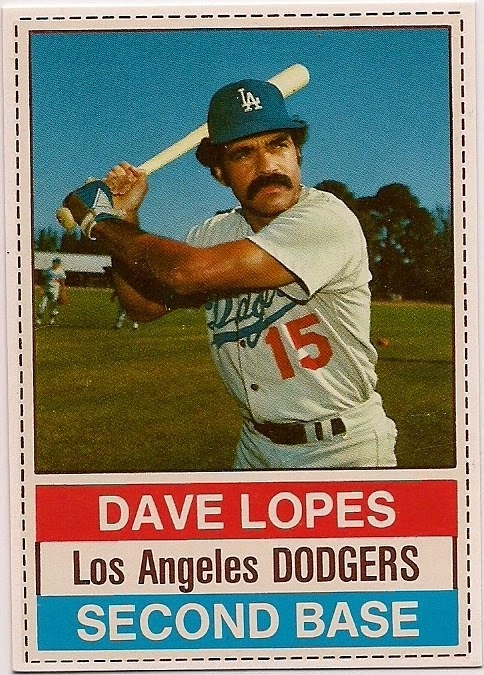 Here is Dave(y) Lopes from the very patriotic 1976 Hostess set, the year that Lopes' mustache was in full fury. 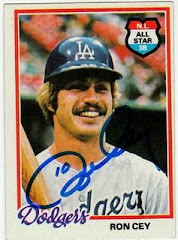 Lopes never smiled in '76 because is mustache wouldn't let him. 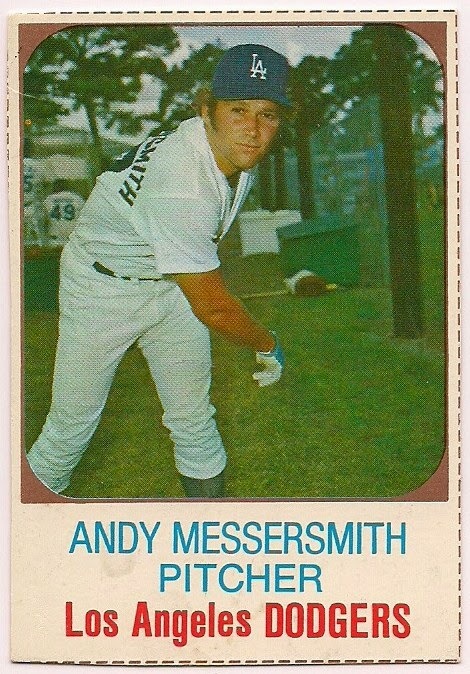 And here is Andy Messersmith from the first Hostess set in 1975. I enjoy Messersmith pitching with his batting glove, and the Dodgers congregating in the background (No. 49 for the Dodgers at that time was Charlie Hough), and that it looks like spring training was held at one of the state parks near where I live. 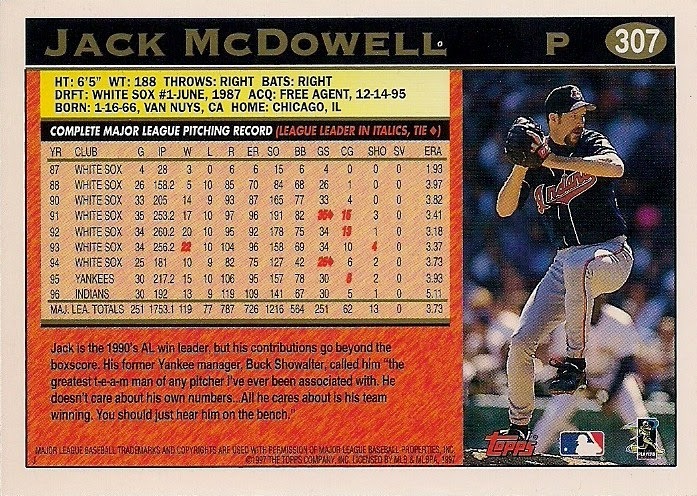 The Messersmith card is a short-print, and during my first real tour through Hostess checklists, I found out how many SPs there are in those sets. That will make obtaining the cards that I want from those sets a slight challenge. I'm finding out now how much of a challenge. The other card that I ordered with my hope diamond Bailey money was the one that I wanted the most. It's the one I mentioned here. 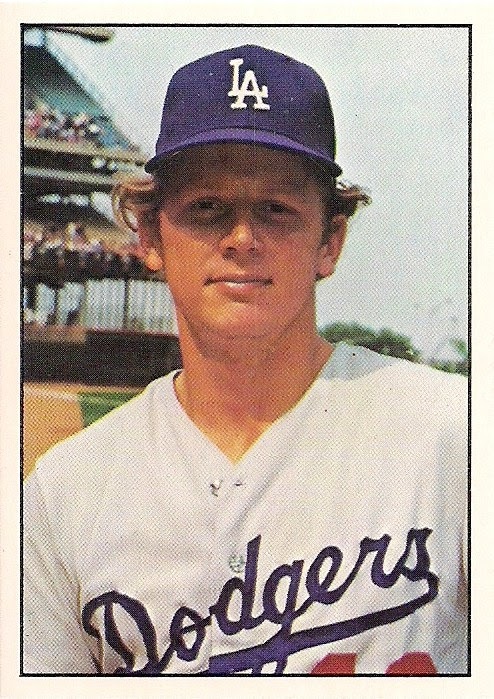 Yup, it's the 1979 Hostess Ron Cey card, an SP. After I made that post, Mark Hoyle contacted me and showed me that the card was available for a reasonable price on a vintage site that he deals with all the time. He kindly offered to order the card for me, but I was so eager to finally get the card that I had ordered it myself before Mark even made the offer. And here I still wait without my card. I paid my cash and paypal let me know that I paid and that's the last I heard. No confirmation from the site that I made an order or that they received my money or that they're shipping out the card. A couple weeks later, I sent an email inquiring about the status. I received no response. Mark says he hasn't had issues with the place and has suggested calling them. I think that will be the next step when I have a moment. But I'm not very happy right now. So, that's almost all of the goodies that I got for one meaningless parallel. Didn't quite get all I hoped for (heh), but it'll work out eventually. 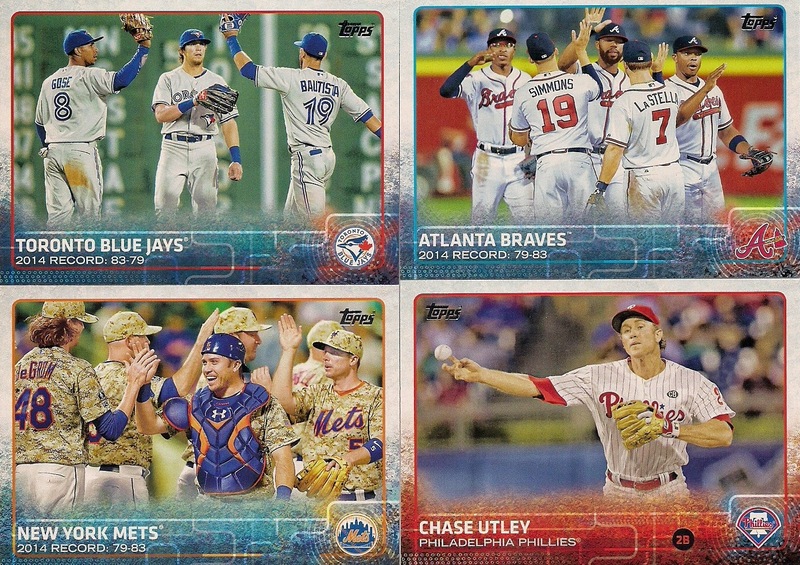 Here comes the 2015 Topps!